Tavoris Cloud is one of the most overlooked elite fighters in boxing. He’s undefeated, holds an IBF world belt (for what that’s worth) and he’s scored wins over Glen Johnson, Clinton Woods and most recently Yousaf Mack. He’s at the top of the light heavyweight division for many fans, rated number three by The Ring but you’d be hard pressed to find any column inches given to him on boxing blogs and websites. This is by no means a scientific experiment, but run a Google news search with “Tavoris Cloud” and tell me what you see. Most of the stories are about Bernard Hopkins and they mention Cloud only in passing. He works under the radar. Part of it is Don King and his sometimes-lax efforts toward promotion. The grey-maned slickster isn't the promoter he used to be when he was putting together the Rumble in the Jungle and the Thrilla in Manila and he's gone off the boil so much he's even ended his long running feud with Bob Arum. 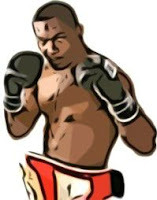 Maybe the fire has gone, quite likely it is his age, but King doesn't boost fighters like he used to. He doesn't have the influence he used to, and this is a pity. Most promoters would make gold out of a fighter with Cloud's abilities. Coming from Talahassee can't help either; it isn’t a boxing capital and Cloud is the only boxer of note fighting out of the college city. Widen your search to Florida in general and you’ve got Andre Berto, Roy Jones Jr, Jeff Lacy and even Kimbo Slice, all of whom get their media fill when they say anything mildly interesting. Okay, maybe Roy Jones Jr’s column inches are negative and Kimbo only draws the freakshow crowd, but Cloud must be sore that he is so overlooked. It’s a shame because he is one of the best in the division and I think anyone would struggle to beat him. Bernard Hopkins? We’ve got no idea what Hopkins has left because his last fight lasted less than two rounds. Welsh world champion Nathan Cleverley? He’d rather defend his title against fighters that barely register on the world scale. Chad Dawson? Maybe Chad could beat Cloud, actually. "Here's the problem: Cloud-Pascal is made, and HBO wants to buy that fight. HBO was talking about either December or January. But the problem is that Pascal and his people are backing out. They want to fight a WBA champ who is 12-1." After the Hopkins-Dawson debacle, Cleverley’s pathetic defence and Beibut Schumenov keeping the WBA belt in his grasp fighting guys like Danny Santiago, the light heavyweight division needs a shot in the arm. A fight between Tavoris Cloud and Jean Pascal would do that. Pascal has been a top-level fighter for years and aside from Lucian Bute, he is one of Canada’s top exports. Put a Cloud-Pascal fight in Canada, not in Floida, and it would blow the gate. It won't happen for a while though; Cloud’s next fight is on February 18th against Gabriel Campillo, a fighter Beibut Schumenov scored a robbery of a decision over. Since his WBA fight with Schumenov, Campillo has gone 2-0-1 with the draw coming against the only decent opposition in the three, Karo Murat. Even though we all know Campillo beat Schumenov, I can’t see any other result than Cloud making short work of him, and probably before the sixth round. You need a high ring IQ and a great defence to beat Cloud and while Campillo is clever, he isn't clever enough to nullify Cloud's all-action style. I want to end by asking why Tavoris Cloud is so overlooked. Is it because of a small fanbase? The division he fights in? Does he not trash talk enough? Shoddy promotion? Are these questions starting to get annoying? If you think you have the answer, let me know.